We have all seen the horrors. The wreckage of a Paris concert hall where extremists turned a carefree Friday night into a bloodbath. “Jihadi John” mercilessly beheading a hostage. New York City's fallen towers. Carnage left by suicide bombers. The perpetrators must be insane, we tell ourselves. Yet how could that be true? ISIS alone has tens of thousands of fighters. They cannot all be sadists and maniacs. No more so than were all 8.5 million members of the Nazi party in 1945 Germany. So how are we to understand the psychology of terrorists, whether they are Islamic extremists, white supremacists or something else? For answers, we called on five experts for a three-part special report. 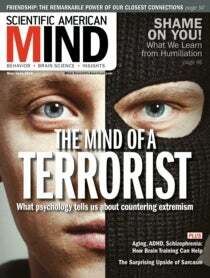 In “Fueling Extremes,” social psychologists Stephen D. Reicher and S. Alexander Haslam, both members of this magazine's board of advisers, use research on group dynamics to show how ordinary individuals become radicalized. This is not a passive process of surrendering to the spell of charismatic leaders. Extremist groups, they write, actively exploit existing rifts and feelings of marginalization to construct an us-versus-them appeal. Nor is their message primarily based on hate: Research shows that only 5 percent of ISIS's recruitment imagery is violent. Most of it stresses the “nobility” of the cause. No wonder fresh recruits continue to join the jihad. Dounia Bouzar heads an organization in France that attempts to open their eyes and bring them back. In “Escaping Radicalism,” she describes her work with more than 500 families to free loved ones from radicalization. In a third article, “Extinguishing the Threat,” social psychologists Kevin Dutton and Dominic Abrams draw on seven key studies for concrete suggestions on how to confront extremism. One lesson of our report is that we in the West abet the schisms that fuel extremism. Donald Trump's remarks about banning all Muslims from entering the U.S., Reicher and Haslam note, has become a sound bite in extremist propaganda. Other stories in this issue explore contrasting aspects of human social behavior. In “For Shame,” Diana Kwon reports on how psychologists and criminologists are rethinking the impact of shaming offenders. There are “many shades of shame,” she writes, some destructive and some that spur contrition and reform. And for a look at our most salutary form of social engagement, read “With a Little Help from Our Friends,” where journalist Lydia Denworth dives into new research about the power—and evolutionary origins—of friendship. The propensity to affiliate is deeply rooted in our species—for worse and for better.